Call me old fashioned, but I like to reserve a table when I’m eating out. A small amount of forward planning allows me to schedule the rest of my day so as to make sure I complete my to-do list. That’s not to say there’s no room for spontaneity, my visit to Padella being a prime example. Chef Savla (CS) and I had wanted to head down to Borough Market for some time, especially since I’d been bending his ear about their 4-month #DemoKitchen residency programme. 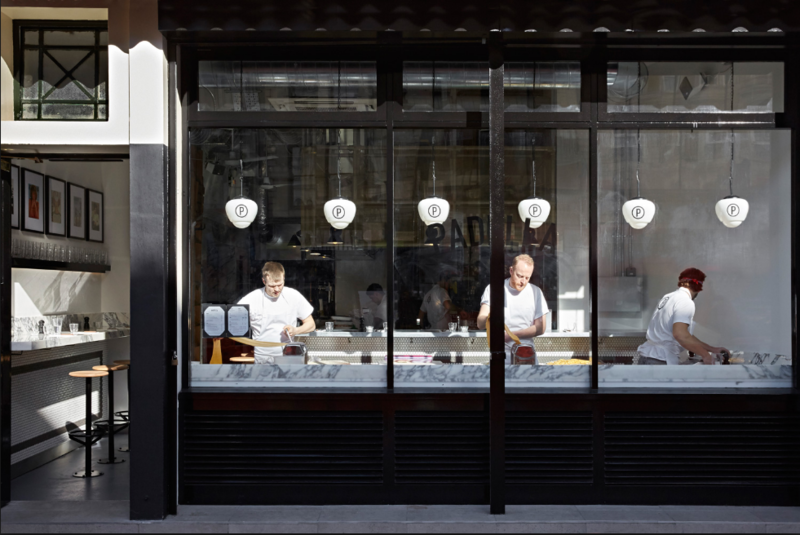 Since pasta-promoting Padella, which was opened earlier this year by the accomplished Islington-based Trullo team, is located on the outskirts of the market, we’d be killing two birds with one stone. Padella review. If you use social media and follow food critics, influencers and bloggers, you’ll have drooled over sensual images of the burrata, plates of pasta and tarts. Eager to try as many dishes as we could muster, we walked the 9 miles between home and food heaven in the vain hope of creating a calorie deficit. Walking around London is fast becoming one of my favourite pastimes; it’s a healthy way to get to know my city better. 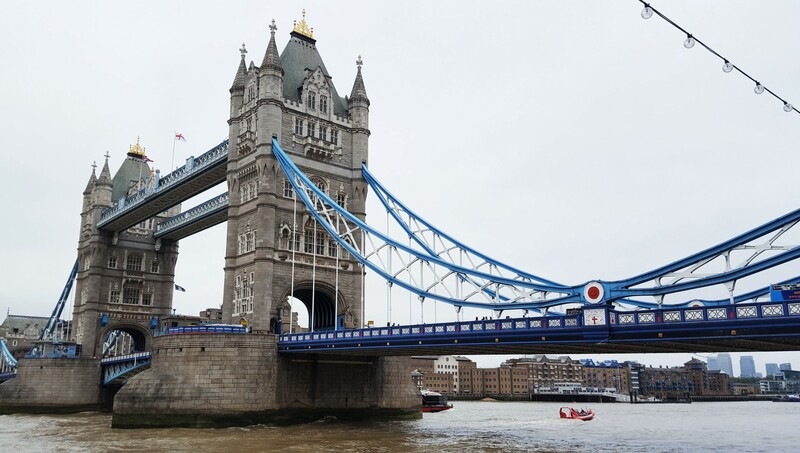 Our route took us through Highgate, Highbury and Shoreditch then over Tower Bridge, which I hadn’t crossed on foot in many years. Padella review. Ambience and decor: After all this walking, we were relieved to stand in line. The 30-minute wait gave us a chance to admire the comforting carbs on their journey from the open kitchen to the hungry diners occupying the outward-facing window seats. 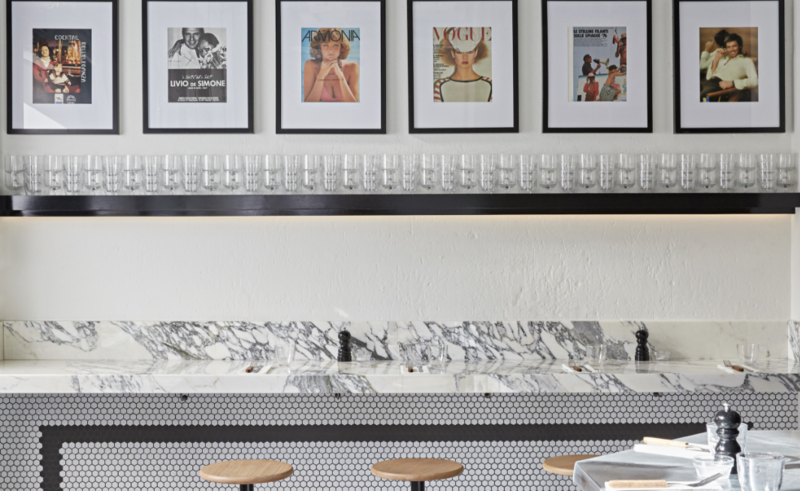 Solid white and grey marble counters jut out from the white walls, the only decoration being a handful of simple, framed prints near the entrance and hexagonal black and white mosaic-style tiling. Additional seating is available downstairs, but we were lucky to get the best in the house: surrounding the kitchen. 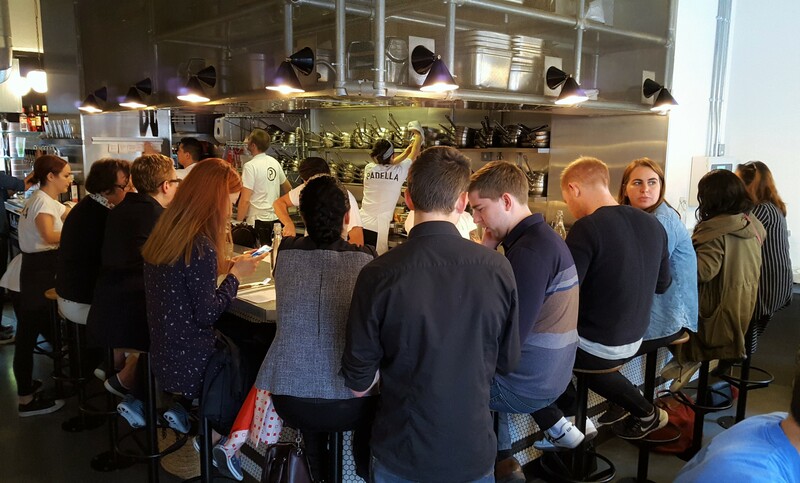 Watching the chefs prepare food and navigate around one another in this compact space is to enjoy a polished performance in which your participation is encouraged. Service: Italian accents welcomed us and kept us updated on the remaining wait time. The entire menu fits neatly onto one sheet of A5 paper and is self-explanatory, so there was no need to interrogate our waitress. Instead we sat back and observed the kitchen camaraderie and listened to the chefs discussing their pasta preferences. Padella review. The food: The pared down aesthetic starts with the decor, is reflected in the menu design and options and ultimately displayed on the plate. Our starters perfectly demonstrated how top quality ingredients require the lightest of touches to be transformed into truly fulfilling dishes. 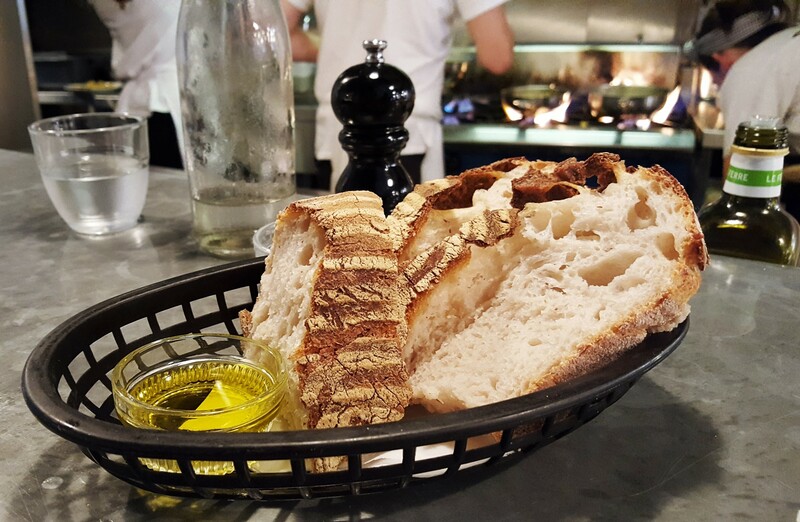 Thick slices of sourdough with fluffy middles and crusty edges were paired with a fruity olive oil; a classic combination reminiscent of many languorous meals in Florence last summer. 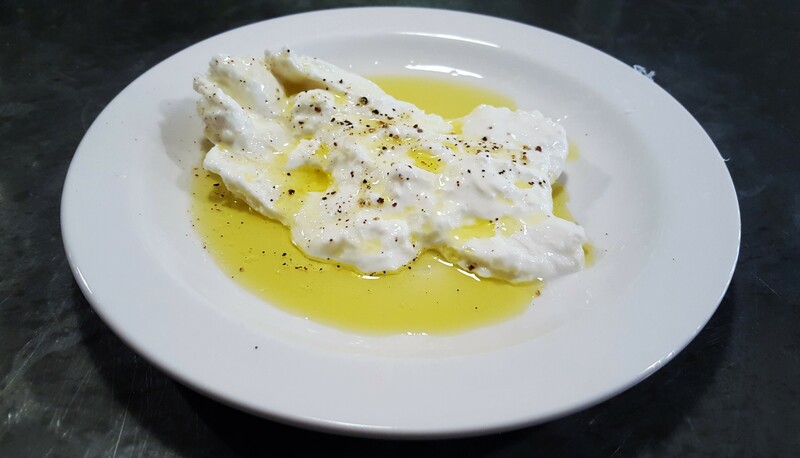 The same oil reappeared with the burrata, which was gently torn open before serving, the golden liquid dripping down the creamy slopes to form tiny puddles in the crevices. Like the bread basket, here were two items which had evidently been selected by a careful hand for their superior quality and taste. Padella review. 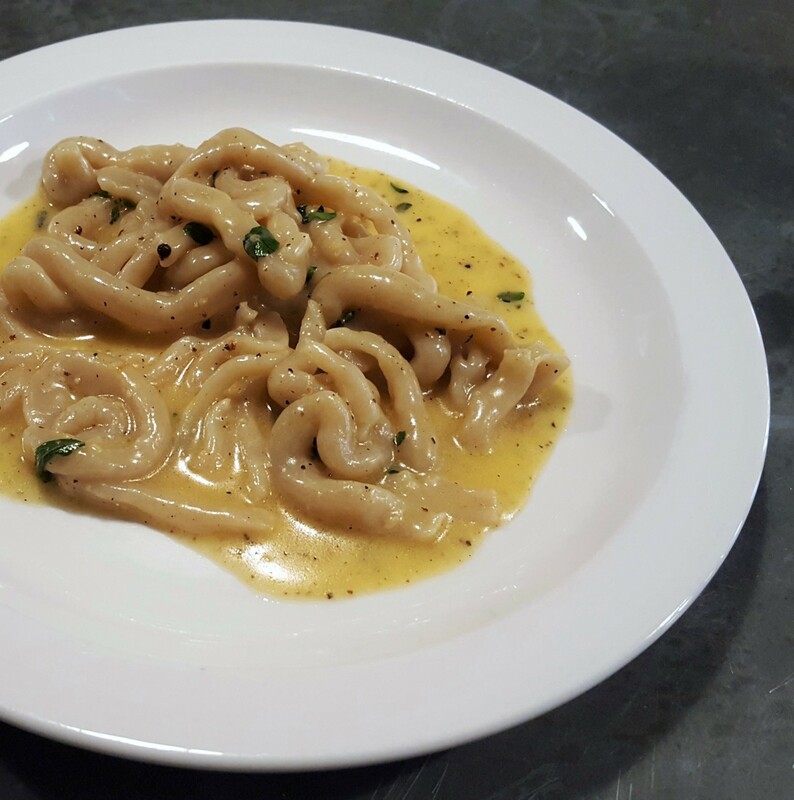 Unlike papardelle, fettucine and tagliatelle, pici was a new incarnation for me and thus instantly caught my attention. These chunky strips of pasta with the odd curly kink may look like anaemic, but are anything but bland. These worm-like wonders were briefly tossed in a pan with marjoram, garlic and butter, joyfully leaping around as if on a trampoline, before being poured onto a plate and generously scattered with Parmesan. This was unabashedly rich, sinfully smooth and smile-inducing: to hell with the calories. Padella review. Slightly belt-friendlier was the 8-hour Dexter beef shin ragu, which has earned its signature status. 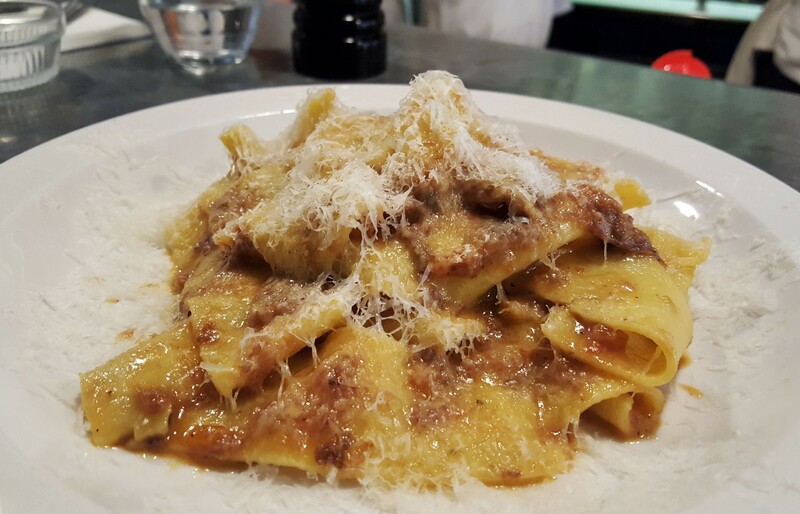 Tiny strips of meat competed with fat, flat pasta ribbons to win the prize for most melt-in-your-mouth item, with the beef taking the top spot by a narrow margin. Slow-cooking it gave it the softest texture as well as an intense flavour, and CS mourned the last bite long before he’d taken it. This might have been the end of the savoury section had we not been watching the chefs peel orangey roasted squash, some corners tantalising caramalised, right in front of us. 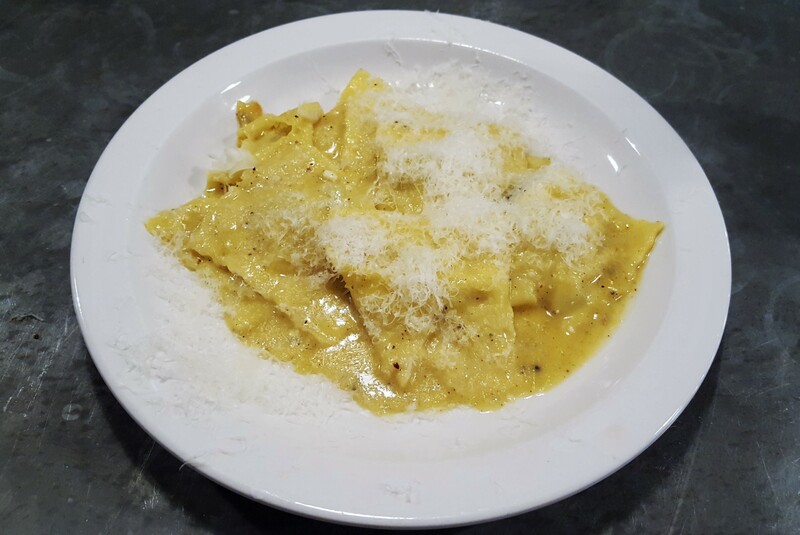 The pulp, having been coaxed into pillow-shaped ravioli along with ricotta, came served in a shallow pool of cheese-flavoured butter. We experienced another kaleidoscope of tastes and emotions: sweet, creamy, silky then pleasure, contentment and ultimately satiety. The predictable dessert of the two options on offer would’ve been the chocolate tart, hence why I broke ranks and picked the almond and fig slice. After the carbs and decadent dairy, the fruit and nut wedge made a welcome change. 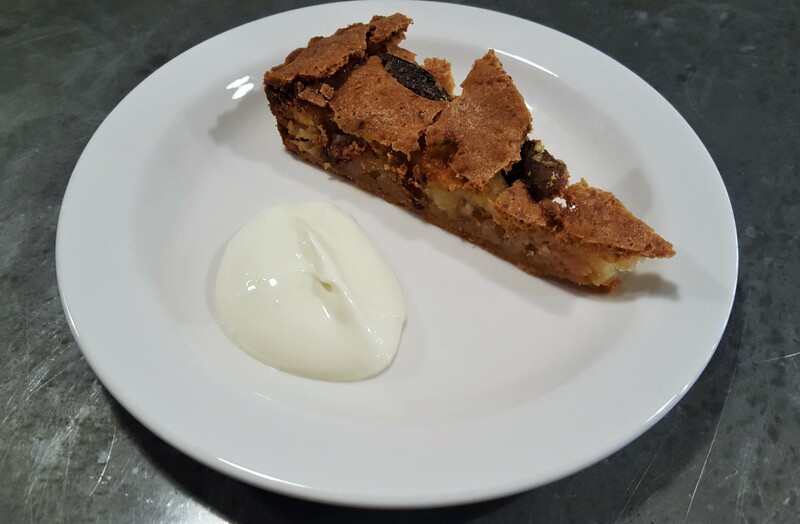 The baked fig was soft and subtle while the nutty almond shards added some spikiness; a suitable end to our early afternoon of Italian indulgence. Verdict:”Like pasta? Love Padella” could be their new tagline. Dried variants may be convenient, but are a poor substitute for the real thing, which Padella have skillfully mastered. 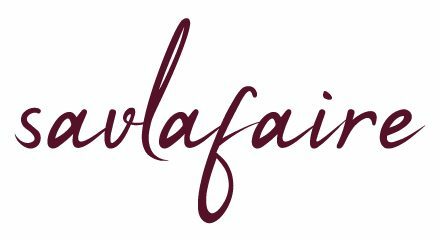 Their short menu showcases serious expertise and passion, with dishes being regularly swapped out for seasonal specials. Go with friends, colleagues or family, go meat-free or all in, just make sure you go. A word of advice: save some space for round 2 of dessert in Borough Market. Padella review. I’ve never heard of Pici but that sounds like utterly dreamy comfort food, especially with the weather starting to cool down! Now that’s pasta worth walking 9 miles for!